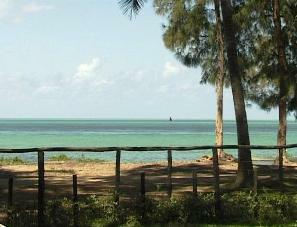 Vilanculos is situated 750 km north of Maputo and is the gateway to the romantic playgrounds of the Bazaruto archipelago. 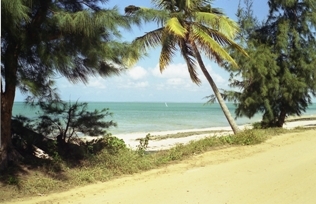 The islands of Bazaruto, Benguerra, Magaruque and Santa Carolina - also known as Paradise Island - make up the Bazaruto Archipelago. The Islands were declared a national park in 1971, ensuring that the abundant species of birds and butterflies, coral reefs,the beaches with dolphin, game fish, shellfish and marine turtles are all protected. You can explore the islands for the day by means of a power boat or romantic dhow. A dhow is a sailboat that resembles the vessels used a thousand years ago by ancient traders between India and Africa. For those, who want to spend more time on the islands , accommodation in luxurious lodges are available. Vilanculos also has its own international airport for direct flights from Johannesburg. Vilanculos Camping is situated on the beach front in the town of Vilanculos, which can be reached by ordinary vehicles. The shady campsite is fenced with 24-hour security and only residents are allowed in the campsite. All sites are equipped with electricity and water taps. The ablutions with hot water showers are kept spotlessly clean all day long. The campsite also boast a 6 bed chalet as well as a 10 bed bungalow, both are equipped for self-catering. The campsite offers a beautiful view of the calm, clear blue ocean and palm lined beaches with safe swimming areas. The campsite also has a bar and restaurant where you can observe the beauty of the islands on the horizon.